Are you looking for a place for your guest to cut loose? Our dance floors start out as 2′ x 2′ sections that we utilize to custom build a beautiful dance floor to accommodate your guests count. We will then add a complimentary black trim to the perimeter of the dance floor to make it safe for your guest to get out there and dance. 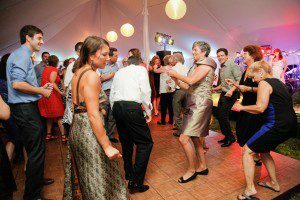 Our wedding dance floor rental options are a great way to add a fun, elegant touch to your wedding. Our Dance Floor Rental Options come in teak or black and white. We offer a full wedding dance floor rental size guide to assess which size dance floor is the best fit for your guests’ count. If your event is located on grass a subfloor will be needed to keep your dance floor level.